From the very beginning of my development of the North American Thebaid Pilgrimage Project, my intent was to include Orthodox parishes in my travels. 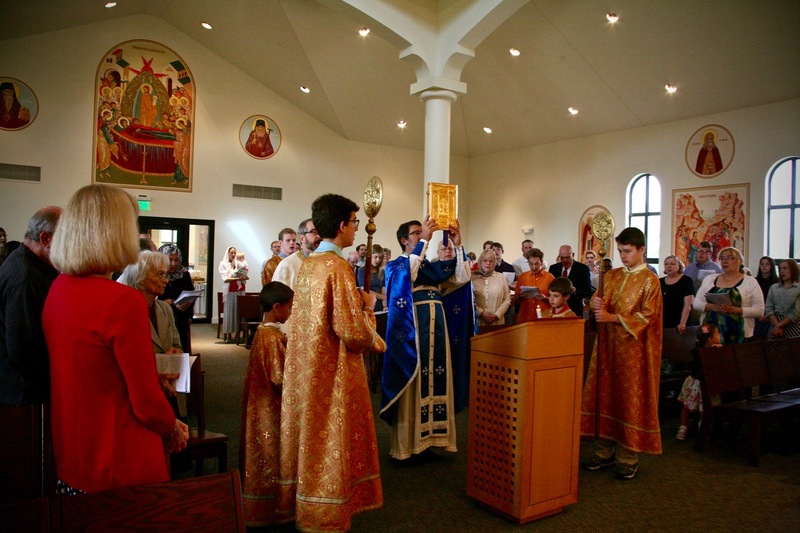 Holy Trinity Orthodox Church, Overland Park KS; Archpriest Timothy Sawchak, pastor. By visiting Orthodox parishes in between my trips to the monasteries, I hope to help inspire greater interest “in the pews” of our rich history of monasticism and its central place in the Orthodox Church, and foster connections between parishes and regional monasteries, perhaps even inspiring some young parishioners to test the monastic life themselves. A signed & matted fine-art print from the Thebaid Project. This Parish Presentation Program has been a solid success, with eight parishes hosting me as of October 2017, and more signing up. In return for hosting a Thebaid presentation, I do ask that either a collection be taken up to support the Thebaid Project, or that I be provided the opportunity to make a direct appeal to those in attendance. I’m very pleased to share with you some of the fruits of this program, with select galleries from some of my host parishes. This includes two mission parishes, two parishes celebrating their 40th anniversaries, and one celebrating their centennial! I’m deeply honored to have been able to contribute to these parishes some strong digital images to help show parish life and draw new seekers to the Holy Orthodox Faith. I call this method of fundraising “creative tent-making,” after the example of the Apostle Paul in Acts 18:1-3. My photographic services to parishes might include documenting new iconography, a building project, photographing liturgical services and the faithful, with the resulting images enhancing the parish website, and used in other ways (e.g. for stewardship drives, promoting special events to the public, etc.). One parish has even invited me back as a paid consultant to help them organize their photos and videos (what we call “digital asset management”) and provide them with hands-on training on photo editing! If you have a unique need or special project, contact me and let’s see how we can help each other! Email me at zosimas@thebaid.org to learn more and to schedule a Thebaid Presentation. Thank you for you support and prayers!